Homemade Cookie Butter. Have you tried cookie butter? It’s traditionally made from Biscoff cookies. I have never actually had the store bought version of cookie butter. Mostly because I am afraid I would eat the entire jar in one sitting haha! The store bought cookie butter also does not have a clean ingredient list. So I sought out to make some homemade cookie butter. This stuff is awesome!! I had to find something to mimic the buttery texture of the Biscoff cookies, so I chose cashews. I have used cashews as a base in many of my flourless cookie recipes and it’s worked out great. So I knew they would be great here. 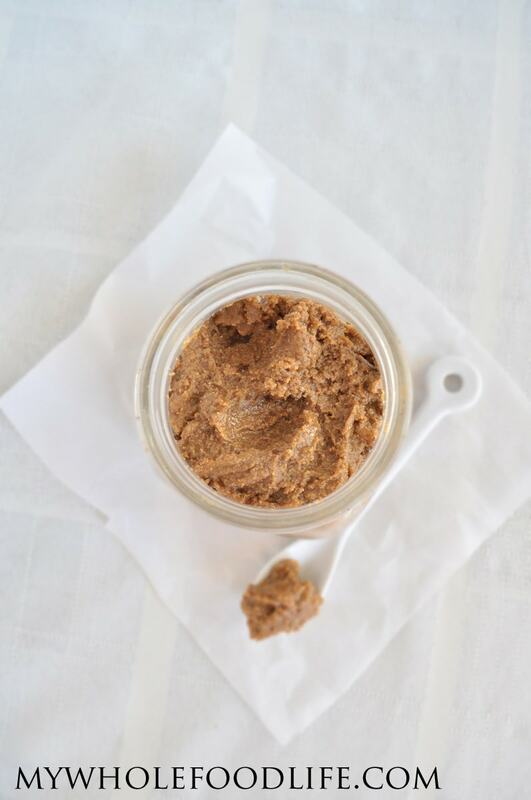 This homemade cookie butter is vegan, gluten free and paleo approved. It contains no refined sugars. I am thinking about using it in some upcoming dessert recipes. Maybe truffles. I also had some with my 5 minute banana ice cream today and it was amazing! Just like store bought, but with much less sugar! In a food processor , grind up the cashews for a few minutes to get them started. Then add in the remaining ingredients and process until you get a nut butter consistency. You may need to add a little oil to get the consistency just right. Keep this cookie butter in the fridge. It should last a few weeks that way! Enjoy! Yum! I made some adjustments to it because I didn't have all of the ingredients. I substituted the maple syrup for part agave/part honey/part apple sauce. I also didn't have cloves or ginger, but regardless, this recipe is delicious! I wanted to make some ever since I got close to the bottom of my Trader Joe's jar. The ingredients in there turned me off too, but I had it in very small increments- the whole jar lasted me about 10 months! This is such a yummy cure for my sweet tooth. Thanks for the recipe! You are so welcome Meg! I am glad you liked my recipe. Instead of using cashews can you use sunflower seeds?and do you have to use molasses and syrup I'm trying for zero sugar lol.please let me know ASAP thanks! would it be ok not to use the syrup? I think the syrup should be okay. Is there another nut I could use instead of cashews? Cashews are actually the only nut I do not like! Yes. I think macadamia nuts would work well too. I am not trying to be a jerk, but you have got so many ads on your site that it is near impossible to navigate. Theres an ad filling up every space and the worst part is that it takes FOREVER for the page to load and it gets stuck. I like your site but this is too much. Can you please send me a screenshot? Are you on mobile or desktop? The ads should not prevent the page from loading. I can let me ad provider know. No reason I can't make this in my vitamix, is there? Haha! I would be too if I ever dared to buy it. I'm sure I could sub a different nut and I know it wouldn't be quite the same. I'm allergic to cashews. What about sunflower seeds or walnuts? They're an oilier seed/nut. Almonds may be not creamy enough. Any suggestions? I have had readers make this with almonds successfully.